Greetings to all who attended the ceremonies at Temple Byron. Holding the first ceremony 7 was sublime. The group of 100 plus attendees was made up of those who had only days before begun the Template ceremonies, those who began it many years ago and those who dropped everything to travel great distances to be there with only a couple of weeks notice. Love and thanks to you all. Greetings also to everyone on the Template database. I know that many of you have already heard of the existence of the 7th Ceremony. During the last Bali workshops we were asked if there was another ceremony – to which we confidently replied, no! The signal that another code was on the horizon came several months later on the morning of March 23rd. The news took us by surprise, but in retrospect, it was obvious. Information steadily surfaced over the days leading up to the June 6th Venus transit. It emerged that ceremonies 1 to 5 were the first phase of the model that established an infrastructure of energetic pathways in preparation for the second phase. The 6th ceremony is the first of the second phase. As you know we did not want to refer to the pathway connected by the Worldbridger Ceremony as a circuit, and unofficially referred to it as a ‘sphere-cuit! This first Worldbridger Ceremony reactivated a spherical field around the body, as does Ceremony 7 (now named the 2nd Worldbridger Ceremony). Through the reconnection of circuitry the first five ceremonies have established the energetic development of the various energy systems of the Human hologram, to be able to integrate and contain the power of the full spectrum of the creative force of Tantra- Kundalini- the activation of the light body. In and of themselves these 33 circuits undoubtedly initiated a degree of this activating force. Jiva and I experienced the activation of the light body to its ultimate degree and function on Green Mountain in Hawaii. Those who have read Worldbridger will know that this activation resulted in our incarnate presence in a transcendent realm. When I experienced a similar activation in the Byron rainforest, Jiva did not, but as the observer saw that my appearance changed to a considerable degree. Both these experiences were designed to instil in us an ever -present yearning to return to the natural Human state. Every day since then we have reached for no less than that ultimate goal. Every ceremony, every circuit has been a step towards it. Not only did it provide an experience of immeasurable inspiration that has sustained us through all the challenges of grounding this visionary insight and process, it provided an elemental experience that was banked in our DNA as a point of reference beyond this entropic paradigm, establishing a holistic perspective on time, space and eternity. This perspective is embedded in the language used to explain it. Until now we imagined that the existing 6 ceremonies would eventually begin to activate these heightened states of consciousness when a critical mass of connected units of circuitry stabilized a morphic field that would support a more profound level of transformation, especially as our first experience of the 6th Code initiated an awareness and visual clarity, as we had experienced on Green Mountain. We were also concerned that those states of super -awareness were going to be difficult to maintain in a sea of all that opposed it: dirty electricity, wireless interference, chemical pollution and a morphic field riddled with the suffering of Humanity. During the activation I experienced in Coopers Creek merely speaking began to bring me out of its zone. So it came as a surprise that the first wave of the 7th C we received on March 23rd was full -on and more intense than the first Worldbridger Ceremony -and repeated the Kundalini activation I had in Coopers Creek, but this time for both of us. Initially we wondered if we were going to be able to translate it into a shareable experience, if people were ready for it and able to integrate it into their lives. When circumstances conspired to make it so difficult to bring in the full code we questioned whether the field was sufficiently stable to allow for the wide use of the 7th code. 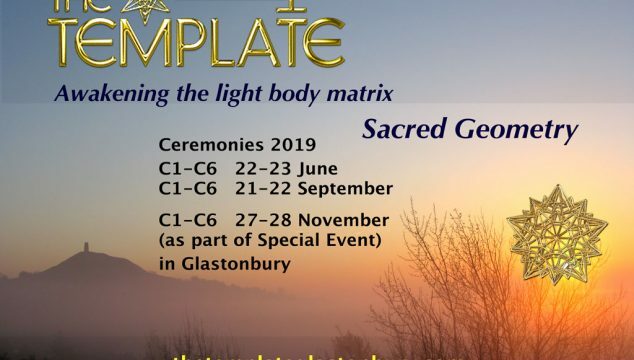 However, the light body activation that infused us at the base of Wollumbin (Mt Warning), gave us the full embodiment of the 7th Ceremony activation and the signal to go through with the translation of it into a shareable schematic was unmistakable. We have since then come to a fuller understanding of the nature of what the 7th Ceremony has established. Every day is revealing more of our coherent appreciation of what is unfolding from within. However, it is not possible to include all aspects of it in a Newsletter. I will at this point explain what will be helpful in assisting those who have been through the ceremony to understand the intensity of what they are experiencing, and to give those who are considering it an ability to make an informed decision. As the first wave of the activation flowed through my being on the morning of March 23rd, the first words I spoke were ‘Vector cube-octahedron’. As you all know I am not the geometrist…Jiva is. Jiva brought through the three pieces of geometry that form a component of the 7th Code. The first piece, the Tantric Matrix, has a vector-cube-octahedron in it and the second piece, the Tantric Vortex, has a double vector. The cube-octahedron was named by Buckminister Fuller the ‘’Vector Equilibrium’ as it is a geometric form that expresses all forces as equal and balanced. It is a vortex through which energy forms into matter. This energetic equipoise expresses in form the creative dynamic of Tantra- the unified potencies of conception – which forms the fountainhead through which the primal principals of Source Consciousness cascade into manifestation. When I experienced the light body activation at Coopers Creek I did not register Kundalini energy rising or descending in my body. I experienced it as imbuing my being in synthesis with my breath, from every point within my field. The field that is established by experiencing Ceremony 7 is approximately one foot from the 6th Ceremony field. These two fields are aspects of the greater field that surrounds us; a field that is the energetic form of differentiated consciousness (Tantra) that defines us as autonomous fractals of Source Awareness; a self-referencing vortex, a torsion field that translates light into a medium with which to assemble and construct the coded co-ordinance that manifests the full masterpiece of the Human design prior to our genetic modification. The state of awareness that a Kundalini awakening initiates is perceived as an extraordinary attainment because of the modification of the incarnate manifestation of the present disconnected Human, suffering the limitations of an energetic disassociation from the holistic continuum. It is difficult to imagine an existence that is endlessly flooded with bliss. Such a state of being cannot be maintained in a dualistic fear- based paradigm, a paradigm in which in order for something to live, something else must die. And yet it is the natural Human state. The propensity for this state is held as a code in our DNA. Our ability to resurrect it is undeniable. Our experiences on Green Mountain and the subsequent experiences since the activation of the second Worldbridger code have made that crystal- clear. A spontaneous Kundalini awakening happens as a result of environmental and cosmic influences interfacing and conspiring to create an alignment that opens a portal of activation, a window- or wormhole- into the holistic continuum that opens…and closes. The 7th Ceremony, through the stabilization of circuitry pathways, is capable of activating a degree of the field of creative potency, Kundalini, because the other circuits have laid the foundation matrix for its ability to be integrated- a degree that will become full spectrum as the entire field is established. As we experienced on Green Mountain in Hawaii, concurrent with the full activation of the light body will be our presence within the Earth’s transcendent realm…what is often termed ‘ascension’…the full Kundalini activation. The feedback we have received since the 7th ceremony has shown that many experienced a heightened awareness that reminded them of altered states. It is easy to compare a Kundalini awakening to those experiences as they can reveal to you through a change in brain chemistry the transcendent realms that a Kundalini experience offers you through natural velocity. Two days after the 7th Ceremony a participant called to give us an important piece of feedback. That day her kinesiologist had told her that her chakras were’ blown out.’ I explained that her practitioner might not have a point of reference with which to measure the activity in her systems. Her chakras were not blown- they were activated. In the light of this information, you can imagine the acceleration of activity in the chakra system when Kundalini activation provides an infusion of electromagnetic energy. As the Human matrix resurrects its ability to accommodate the full spectrum of the Maha-Gaia Tantra of Creation it may well be that dormant chakras are activated. The third eye alone has seven sub-chakras. As the workbook states, chakras are “holonomic inter-dimensional portals that link the body system from one dimension to another”. This explains the experiences many are having of entering the periphery of the transcendent realm. It is this reality, this planet – but in a frequency that reflects the fullness of the Source Code. This was written in 2004 and published in 2005 as part of the presentation of the 3rd Ceremony, Sacred Breath. 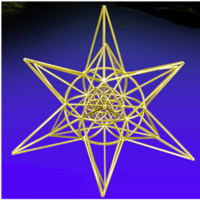 It is important to note that the Heart Star is a stellated cube-octahedron. Its code within the alchemical ceremony references the Human as a sensory instrument for the Benevolence of Creation. This echoes the dynamic identity of the Human as a fractal of the Maha Tantra. The 7 circuits connected in the Ceremony of Sacred Breath are intrinsic to the ability to activate and integrate, through the pranic mechanism, the Breath of Immortality, as these circuits establish the infrastructure. The Breath of Immortality is intrinsic also to the activation of the torsion field that occurs in the activation of the light body instigated by the 7th Ceremony. The cube-octahedron is intrinsic to both ceremonies. It was at the stage of the Sacred Breath Ceremony that we began to perceive the holonomy of the transcendent model that is the Template. There are also reports of bodily discomfort in the process of integrating the Kundalini energy, reports that we have also heard from participants after experiencing the 6th Ceremony. It is simply your body adapting to integrate life- force. Those who experienced what they termed dizziness and motion -sickness needed a peaceful space in which to stop and be with the flow of Tantric energy, to embrace it and breathe it into their bodies, to feel that state of connectedness, of joy, bliss and the outpouring of love for all. As I mentioned above, we were concerned about the ability of the individual to maintain this activation against the entrenched opposition that constitutes the matrix of this mutant entropic paradigm- which is why this activated state goes into ‘sleep mode’. It is you regulating yourself, determining when it is appropriate to infuse your circuitry system with the Tantric frequency in order for you to more fully embody it. Be assured it has not disconnected or dissipated! Its presence is a constant in your field, awaiting your readiness to embrace it. Our own experience is that ‘rushes‘ can wash through us spontaneously and we simply take some time to unify with it…to breathe it into our bodies…our hearts. It can also be consciously reactivated in various ways to integrate it and relieve the sense of disorientation that some are going through. As with Worldbridger 1 (the 6th ceremony) this second Worldbridger activation is energizing all the other 33 circuits to a more dynamic level. This will undoubtedly set in motion a deep cleanse on all levels -(oh no, here we go again!). As I mentioned to Karl a few days ago, we are not only reprogramming dysfunctional tendencies that have manifested in this incarnation, we are dealing with the entrainment of eons that has reduced the magical Human to a level of desperate survival in a mutant paradigm. The healing process is immense -and yet it has been instigated and continues holistically and gradually with every breath you take. You will not be given more than you can truly deal with. It may be uncomfortable – however, what kind of shamanic healing journey would not take you through a purge? All who have reported ‘falling off their perch”, as Karl so perfectly put it, have felt the underlying sense of gratitude to be in a position to have this opportunity. ”Never was there a time when I did not exist, never will there come a time when I cease to be…I die only to the reality of duality and this I do consciously in every moment, reborn simultaneously in my radiant body of light’. The Maha Tantra of Creation is the energetic development of differentiation from the One, from the Source: the creation of autonomous fractal aspects of Primordial Awareness in order to experience relationship. This Tantric Source Code is the energy that comprises the field which is reactivated via the 7th Ceremony. The fact that vortex geometry is a component within a code that activates a torsion field around the body is a testimony to the power of sacred geometry as a component within the realization of the transcendental Human. That this can be achieved through the alchemy of ceremony will be difficult for many to accredit. Even those examining and researching alternative ideas regarding the higher physics of creation and the mathematical understanding of geometry are dismissive of the simplicity and spiritual connection of alchemical ceremony. They are reluctant to surrender to an experience that reaches beyond the academic conclusions and limited perameters of the scientific model- a model which is ignorant of the Divine Immortal Identity and oblivious to the core mutation that has created the problems they want to solve. They are challenged by the experience of intimacy and vulnerability that comes with the recognition that they are the source, generating not only the addictive behavioural patterns that contribute to the fear-based morphic field, but which also transmits the brainwave frequencies that stabilize it. Once this has been recognized, they would need to take up the challenge of reconstructing and transforming the biotechnology that would heal the situation…the one they see in the mirror. It is easier to take up arms against the madness than to see yourself. The courage needed to crusade against the many apparent injustices of this world pales against the commitment needed to face one’s own shadow…to become the change. “The western mind searches for validation of experience through intellectual analysis”. Ceremony unfetters the intellect from its dogmatic space-time parameters, opening a gateway into a limitless continuum, an experience which is an authentication of the inherent perfection that resides in the innocent heart of each Human masterpiece. Ceremonies are spatial, animated, interactive mandalas that invite you to integrate your sense of self into the wheel of eternal existence…cog by cog, as what you know becomes who you are. Ceremony is alchemy, a theatre of unification where the reconciliation of the scientific and the spiritual are seen to actuate the miraculous truth of creation because matter and spirit are the same energy in different stages of expression. It’s all Tantra. We are still compiling feedback from those who have done the 7th Ceremony. Here is a letter we have had permission to share: testimonial. We do not feel that there is anyone, who, in this time of essential transformation, is not ready for this level of the Template. However, it is important that you ask yourself if you understand and desire the potential this model is offering, and if you want to make the commitment. We take a lot of time and energy to inform those at our workshops of the nature of this reality and the mutant programs that stabilize it. At the same time we ask you to acknowledge the inherent capacity you hold within the masterpiece of your being that can actualize a transcendent reality, a realm that is in resonance with the true Human beyond the insanity of this fear-based reality. With all the information before you it is in your power as to whether you decide to go forward with a model that is clearly collapsing programs which are reliant upon the synthetic mutant matrix and activating the disassociation from a consensus reality generated by a mass of modified units of consciousness. You are doubtless already feeling there is less and less to relate to in this reality. Most probably even before the first ceremony you felt ideologically and culturally isolated as result of arriving on a planet that has for some time been receiving dense beams of transformative codes from the centre of the galaxy, known by the Maya as Hunab Ku. We meet so many beautiful people at our workshops. The 7th Ceremony was like a family coming together. Your quintessential desire to resurrect your divine Identity…not only for yourself, but for all Humanity, is a compelling reason for many of you who come to the Template. For others is it is another stab at feeling better in world of suffering -and we wonder if those people understand the extent of the journey. The sense of disenchantment and isolation experienced by many of you has been and will continue to be felt. Beyond thought and emotion this sense of disorientation will become manifest physically, as many learned at the 7th Ceremony. As I have explained above, this is due to the fact that your bio-computers are deciphering more of the Tantric Field and bringing that transcendent realm into your consciousness. In the years ahead, as this experiment in this mutant paradigm continues, this will become your most treasured ability. It is a huge decision. The choice is yours. We are considering making a Worldbridger 2 Phi Sonic Resonance DVD/CD. Due to our workload with the 13th Circuit Ceremony DVD we cannot do so for some time. However, those who were at the C7 in Byron will recall the use of whale song before and after the ceremony. Whales are inter-dimensional dreamers deciphering the harmonics of creation and composing cosmic melodies to keep alive Earth’s memory of her transcendent Self and her place within the Eternal Constant. These euphonious sounds are a neuro-coustic system of healing that will assist you to integrate the frequencies brought in by the 7th Ceremony. If you are travelling it would be advisable to leave a day after the ceremony before getting on a plane, driving, etc. There were a few people in Australia who booked in and a couple of days before the event began to feel the sensations of dizziness that can come with 7th Ceremony activation. They thought they had come down with a virus, and cancelled. As I said, until now we imagined that the existing 6 ceremonies would eventually begin to activate these heightened states of consciousness when a critical mass of connected units of circuitry was actualized. To a considerable degree this has been achieved through the offer of the first DVD, now freely circulating in the public domain. Many hundreds of thousands (the number is now immeasurable -as well as it being on Vimeo, people have put it on their own websites and it has gone out on many widely distributed newsletters) have reconnected 12 Foundation circuits as a result. The completion of the second DVD which reconnects the 13th Circuit needs to be accomplished asap. I leave you with the words of Terrance McKenna…words that resonate with prophetic truth in this time of transformation.